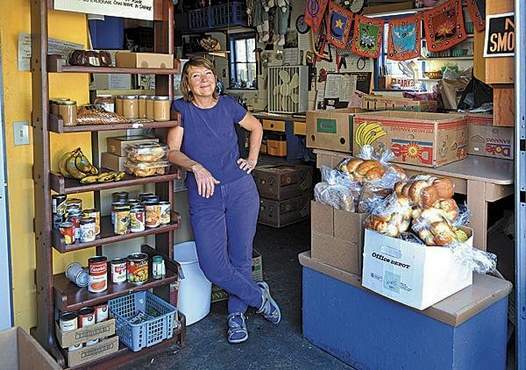 Begun in 1996 by Pamala Joy with the purpose of retrieving food which would otherwise have gone to the landfills, and redirecting it to the people in need, this project has grown each year to include both more recipients and more donators. Starting with a once a week food pick-up for the Northwest Seasonal Workers, within a year or so collection became a daily event and the food was distributed to other organizations. Hundreds of people have been involved with the project over the past sixteen years and tons of food have been kept out of landfills. 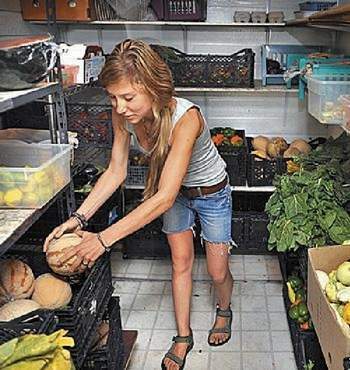 Pamala Joy, Director of the Ashalnd Food Angels in her distribution center. The Ashland Food Angels could not function without the hard work of our Volunteers who collect food each morning and evening from various sources, including The Market of Choice, Shop 'N' Kart, the Ashland Community Food Store, New Sammy's Bakery, organic farmers (in season), and caterers, as well as from individual gardens and orchards. Food is sorted, reboxed and delivered to a variety of organizations, such as the Ashland Food Bank, the Senior Center, Headstart and DHS, who distribute the food to low income individuals and families in the Rogue Valley. Food Angel Volunteers work with both the recipients and the food donors to educate and encourage increased awareness regarding recycling, as well as understanding of those in need. Ashland Food Angel Volunteer hard a work in the cold storage room. Pamala Joy continues to hold the main focus of the project, with continued support from regular volunteers. She acts as a coordinator between the volunteers and donors and distribution groups, ensuring that each group is served in the best possible way. She enlists, trains and supports volunteers, keeping track of daily pick-ups and deliveries, serves as a network source for connecting people to services when needed, answers requests for food for special events, and insures that food is distributed fairly and according to the needs of each group. The population served by the Food Angels includes students of all ages, particularly those connected to Ashland High School, HeadStart preschool and SOU, homeless people, Native Americans, Mexican Americans, special needs people, seniors, single parent families, those with disabilities, and people with low incomes.